TEN has confirmed its schedule for the first week of the 2013 ratings year and it returns several big name brands. This is a pretty good line-up, although it is still holding off on Wednesdays where Mr & Mrs Murder is expected to emerge. Amongst the changes are new Simpsons on Sundays, Graham Norton switching to Sundays and The Living Room now at 8:30pm Fridays. It was David – the one where Cam is in costume from CATS while he tries to save a tree. Gloria also pretends to go into labour. It was the last new episode that aired before Christmas. Bad promoting on Ten’s behalf! Maybe they forgot they aired it….. So, we sit down, all set to watch the new Modern Family tonight…..only it was a repeat of the last episode aired last year! Hmm.. .was it “When a Tree Falls”? Jay and Manny are pushed out of their comfort zones when they attend a kid’s Olympics-themed birthday party, and Claire brings Gloria along on a trip to Costco. What a waste of a slot for sun 9.30. If elementary rates really well then there should be a show just as big behind it! I hope “Africa” gets an encore screening on One. it deserves to be seen in HD. Would it not have made more sense to leave the living room at 7.30pm on a Friday to build on its audience against bh&g and move Idol after it, particularly if glee repeats are (currently) scheduled to 9.30 fridays – you know, pair music with music?! Just a thought. Can someone explain why Ten would show new episodes of “Glee”on Wednesdays and repeats on a Friday??? It is a continuing serial structure and the repeat eps are at least a year old, which would be very confusing for a casual viewer. I cant see the point in programming the repeats at all. Ummmm….Reef Doctor….that is another I have been waiting for ….any start date for it that I may have missed…. Looks like a good line-up, except I’m not sure about new episodes of Bondi Vet on Saturdays, but I will watch it no matter what day it is on because I love that show. I am waiting for Mr. & Mrs Murder…. But they have lost me changing The Living Room and Graham Norton…. David when is puberty blues comeing back its the only show im inrested in on ten. also anything on nurse jackie yet or? 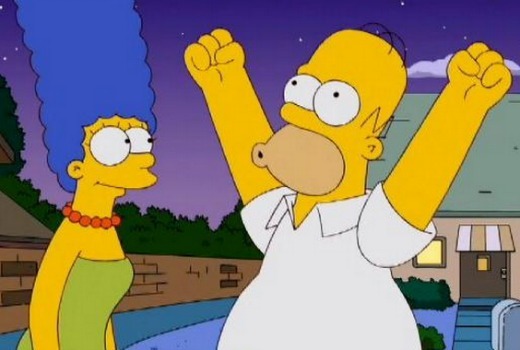 So it’s official The Simpsons is back on TEN. Will Neighbors be next? White Collar, Burn Notice Blue Bloods, Psych and Vegas can go to One HD where the first 4 shows named were, but Ten have stuffed them around too much. Looks like a good line up but the Living Room should have remained at 7.30 and I reckon Graham Norton after COW. That said the last time I saw Graham Norton it was at 9.30 on Abc2. TBL to take Masterchefs time slot and Idol won’t sustain numbers in its time slot so there’s another couple of nights if they decide to strip TBL over more nights. I hope not though.